Type DD Air Filters - Airsan Corp.
Airsan Type DD filters are heavy-duty, easily cleanable filters designed for engines, compressors and other industrial applications that do not involve corrosive environments. These filters offer a slightly higher filtration, cost-effective alternative for applications that don’t require all-metal construction. Made with a galvanized steel frame and long-lasting polyester media, plus expanded metal face pieces – front and back – to prevent media shifting. These filters will provide years of reliable performance with low-cost routine servicing. AIRSAN TYPE DD FILTERS ARE HEAVY-DUTY, EASILY CLEANABLE FILTERS DESIGNED FOR ENGINES, COMPRESSORS AND A VARIETY OF OTHER INDUSTRIAL APPLICATIONS THAT DO NOT INVOLVE CORROSIVE ENVIRONMENTS. THE TYPE DD IS A SLIGHTLY HIGHER FILTRATION, COST EFFECTIVE ALTERNATIVE TO OUR TYPE W FOR MANY SIMILAR APPLICATIONS THAT DON’T REQUIRE ALL-METAL CONSTRUCTION. MADE WITH A GALVANIZED STEEL FRAME AND LONG-LASTING POLYESTER MEDIA, PLUS EXPANDED METAL FACE PIECES – FRONT AND BACK – TO PREVENT MEDIA SHIFTING. 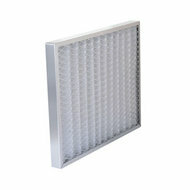 TYPE DD FILTERS WILL PROVIDE YEARS OF RELIABLE PERFORMANCE WITH LOW-COST ROUTINE SERVICING. FOR HIGHER FILTRATION REQUIREMENTS, AIRSAN OFFERS TYPE DDF FILTERS WITH A WASHABLE, NONWOVEN FELT MEDIA. BOTH TYPE DD AND DDF FILTERS ARE AVAILABLE IN STANDARD AND CUSTOM RECTANGULAR SIZES, AND AVAILABLE IN GALVANZIED STEEL, ALUMINUM OR STAINLESS STEEL.